We found the BlackBerry PlayBook to be a pretty solid piece of hardware, but it seems there was a problem batch — an inside source tells us that nearly 1,000 faulty tablets were shipped to Staples, and now they’re being recalled. We’re hoping that Staples (and any other affected retailers) will reach out to customers and inform them of the problem right away, but just in case that doesn’t happen, we’ve compiled a searchable spreadsheet of all 935 alleged serial numbers for you to check against your own. Find it right after the break. Update: RIM tells Crackberry that the faulty batch of tablets was indeed limited to the approximately 1,000 units described here, and that they had a faulty build of the OS. Furthermore, the company says that only a few went out to customers and that most are still in distribution, so with any luck you’ll never have to deal with this problem to begin with. The BlackBerry PlayBook looks set to go 3D, with an impressive demo shown-off at BlackBerry World this week. Following its recent acquisition of The Astonishing Tribe (TAT), renowned creative developers, RIM has been beavering away on the 3D content, keen to capitalise on the current 3D buzz, no doubt. 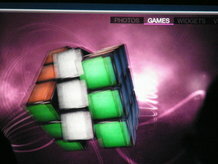 TAT duly showed off someimpressive demos, including 3D widgets, games, a 3D Rubik’s cube and more. Although the tri-dimensional announcement was somewhat played down by the Canadian communications company, the fact that the entire 6,000-strong audience were given 3D glasses for ‘a special 3D presentation’ from RIM co-CEO Mike Lazaridis, makes us suspect that it will be rather more of a big deal in months to come. The glasses were required to see the 3D PlayBook content which was relayed by HDMI cable to the big screens – the same can be emulated at home to a big-screen TV. Claiming that the 3D capability can be rolled out as soon as it is given the nod, TAT explained that the dual-core processor on the PlayBook allows it to handle the 3D images. The announcement formed part of a lengthy presentation at which RIM showed off Android apps for PlayBook, a native email client for the slate and announced that future BlackBerry smartphones are to get Bing integration. Officially confirmed by RIM, the PlayBook will support the BlackBerry Java app and the Android app, This includes the native C / C + + development, HTML5, Flash and AIR and other support, in addition, there will be Ideaworks Labs ( AirPlay) , Unity Technologies (Unity 3) and other game-related engine. As for the BB Java with Android apps to use part of the installation, RIM will release two software for providing run-time environment of the “app player”, after installation, software can be downloaded through the BlackBerry App World . However, the current only part of support for Android 2.3-compatible app, but to play the Honeycomb apps on PlayBook should also be expected. The software developers will soon get PlayBook SDK, which can be carried out by C / C + + app development work, to write BlackBerry Tablet OS compatible app; do not know the combination, Whether that will let you think the PlayBook is over the value of it? Despite the public speculate that PlayBook may be delayed, RIM co-CEO Jim Balsillie (Jim Balsillie) said on Monday, will be launched from March to April, flat is on track. Mobile World Congress in Barcelona to participate when Balsillie said that the development of tablet PCs were as expected. Some analysts had said the Playbook’s battery isn’t as good as competitors, Balsillie does not recognize this. In the exhibition, RIM unveiled high-speed Internet Tablet PC 4G, Apple did not 4G version of the iPad, which may be welcomed by operators. Balsillie said, PlayBook will be priced below $ 500, according to the different carrier subsidies, the price will be the “essence” of the lower. About Playbook will or not support Android system, Balsillie declined to comment on.